This tutorial explains various ensemble methods in R. Ensembling is one of the most popular method to build accurate predictive models. Ensembling is a procedure in which we build multiple models based on similar or dissimilar techniques and later combine them in order to gain improvement in accuracy. The idea is to make a more robust predictive model which absorbs predictions from different techniques. In layman terms, it is considering opinion from all relevant people and later applying voting system or giving equal or higher weightage to some people. 1. Build multiple models using same or different algorithms on training data. We can either use same training data with different algorithms or we can use different splits of the same training data and same algorithm. 2. Make predictions on test dataset using multiple techniques and save them. 3. At the last step, we make final prediction which is based on either voting or averaging. This step is explained in detail below. In this method, we take simple average (or mean) of the predicted probability on test data in case of classification model. If it is a regression model, calculate by taking mean of predicted values. Step I : Multiple different algorithms are trained on training data. For example, Boosting Trees and Single Decision Tree were trained on a data set. These are the two classifiers. Step II : Apply cross validation (k-fold) using training data. Let's say, you run 10 fold validation. Step III : Calculate and save predicted probabilities from each of the 10 folds. Step IV : Combine original dependent variable and two columns of the above predicted probabilities from boosting and decision tree. Step V : Run Logistic Regression on data set prepared in step IV. Step V : Capture two coefficients (ignoring intercept) derived from logistic regression. Step VI : Calculate linear weights based on the coefficients. In this step, we are calculating the overall importance of a variable. It is important to take absolute value of coefficients before calculating linear weights. Step VII : Predict on test data using trained models. Step VIII : Calculate Ensemble Learning Prediction Probability Score by multiplying weights with predicted scores. Every model returns predicted probability on test data and the final prediction is the one that receives majority of the votes. If none of the predictions get more than half of the votes, we may say that the ensemble method could not make a stable prediction for this observation or case. In this case we give higher weightage to the votes of one or more models. To find which models to assign higher weightage can be calculated using the logic we used for weighted average method. It is also called Bootstrap Aggregating. In this algorithm, it creates multiple models using the same algorithm but with random sub-samples of the dataset which are drawn from the original dataset randomly with random with replacement sampling technique (i..e. bootstrapping). This sampling method simply means some observations appear more than once while sampling. For example, Random Forest is a bagging algorithm. Boosting refers to boosting performance of weak models (decision tree). It involves the first algorithm is trained on the entire training data and the subsequent algorithms are built by fitting the residuals of the first algorithm, thus giving higher weight to those observations that were poorly predicted by the previous model. Adaboost, Gradient Boosting and Extreme Gradient Boosting are examples of this ensemble technique. In the code below, we are combining various models such as random forest, extremely randomized trees, Gradient Boosting Model, Support Vector Machine and Rotation Forest. Later we are applying linear weights which are calculated from logistic regression model. 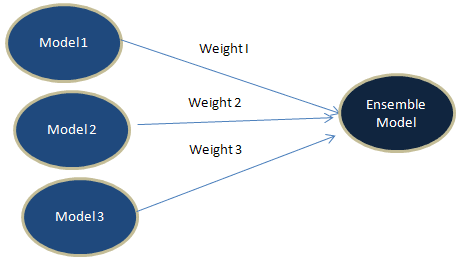 We can use neural network to find optimal weights for stacking. It would calculate weights from input nodes to the output node. To accomplish this task, we can limit the number of hidden nodes to 1. It automatically adjusts the total sum of weights as 1. We can implement the same with R via deepnet package. See the code below for reference. In R, there is a package called caretEnsemble which makes ensemble stacking easy and automated. This package is an extension of most popular data science package caret. In the program below, we perform ensemble stacking manually (without use of caretEnsemble package). We can also use logistic Regression for stacking. It uses simple linear classifier as compared to GBM. The sophistical models such as GBM are much more susceptible to overfitting while stacking. The use of ensemble learning is very common in data science competitions such as Kaggle. Most of kagglers already know about this algorithm. They generally use it to improve their score. Also if you look at the solution of Kaggle competition winners, you would find the ensemble stacking being the top algorithm to combine multiple models. Ensemble stacking does not only improve accuracy of the model but also increase robustness of the model. In the past, I have used this algorithm several times in real world data science projects. It helped to improve accuracy by 10 to 20%. But we need to be very cautious about it. Sometimes it leads to overfitting so we need to make sure we cross validated the result before implementing it in production. Please share your experience about it in the comment box below. 11 Responses to "Ensemble Methods in R : Practical Guide"
It was a great help in understanding the blending. Why should i remove - n.minobsinnode = 10? It is one of the tuning parameter of GBM. I was using the older version. By the way, very good post. Cool. Glad you found it useful. thanks for sharing.. was very helpful.. I copied and pasted the code above and run it on my computer. I ran into this problem I couldn't figure out what went wrong. Attached is the code, and the last line is where the problem occurs.
" Error in eval(expr, envir, enclos) : object 'rf1' not found"
Hi. First, I like to thank you for the great and easy to follow walkthrough. I have been able adapt this to several other algorithms and it works fine with expected results. However, I have challenges understanding what exactly this training$OOF_dt and this testing$dt are. My understanding is that, one is just a sorted form of the other and I know they form new columns in the training and testing sets.The confusing part is that you referred to "training$OOF_dt" as another prediction. I have one question though. How can we use Grid (expand.grid) values for different algorithms?